Ok, basically since being let go from evil-corporation-that-shall-not-be-named, I have put on roughly 20 pounds. This is due to two factors. 1 - I moved in with and began making dinner for Marc. Marc does not eat diet meals for dinner. 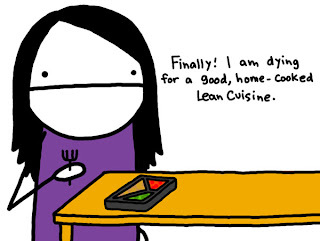 So when I make an amazingly scrumptious, ridiculously calorie filled meal for him, it's not like I then pop a Lean Cuisine in the oven and eat that instead. I totally share in tasty, tasty, too many calorie goodness. Marc also keeps junk food lying around. Because he likes junk food. And when I am weak, I like junk food too. Also when I am tired. Also when I am sick. Also when I am stressed. Ok, so pretty much always. 2 - I am working two jobs, basically around 12 hours a day most days in order to make less that I made working the one evil job. This is to pay for the ridiculous amount of debt I am in, and rent, and other expenses of life. Now one would figure this would make meal planning easier. And for the most part, it does. I take 3 pieces of fruit, a diet meal, a protein bar and a yogurt to job 1 - these are consumed between 8am and 4pm. Then I go home, shovel another diet meal and some veggies and go to job 2. Then problem then is, when I leave job 2 at 10:30-11:00 p.m. I am STARVING again. I usually solve this problem by grabbing a burger, or binge eating on the massive amount of candy that is always lying around our home. Because screw cooking anything at that hour, and celery sticks just aint gonna cut it at that hour. Did I mention between these two jobs that I pretty much never work out? Because I'm exhausted all the time. So it's not like there's work-out time that can make up for the extra calories. Endgame? I need suggestions - does anyone know anything wonderful that I can eat late at night that won't completely screw over the day of d ieting? Drinking water does not cut it here either people, I tried that route. It is NO GOOD. What would be especially helpful in this scenario is a portable snack that tastes good and won't ruin my day. That way, I could take it to job 2 and eat it maybe an hour before I leave, so that I burn some of it off. Also - does anyone know any QUICK calorie busting routines. I am thinking of maybe trying to get up 15 minutes earlier. It would be great if anyone knew some quick tricks that might aid in burning some calories that would not completely eat into the very little sleep I get. Thanks all! And best of luck to anyone else who is trying to lose weight/exercise/find a real legal job in this market. This is long, so...haha, I apologize in advance. My biggest suggestion? Eat more veggies! Obviously I dunno what your work is these days, so I don't know what you can do food-wise. But..hm. I mean, lately what I've been doing is eating hummus and a whole cucumber and some grape tomatoes for lunch and then fruit for breakfast (packaged apples are awesome, btw). Also, diet food is sometimes full of sodium. So if you get a day off, cook stuff that is fresh (and doesn't have a bunch of weird stuff/chemicals in it) that will make you feel good AND full without putting you over in terms of calories. And maybe try to convince Marc to do some cooking? Even if it's just chicken and veggies and some rice. It's a simple meal, and just eat less rice than you'd give to him. I've been cooking for Alex and have to be the food-conscious one because he'll eat ramen noodles all day every day if I let him. Also? Salads are good times. Especially if you put a bunch of stuff on 'em. Get the spray dressing that is like 90 calories for 10 sprays, which is more than enough for a salad.Then put your favorite veggies and some kind of meat and maybe nuts or something. They're filling and tasty when you go a little crazy with the add-ins and they don't take too long to make. Also, I love salads that have been kind of marinading in itself for a while, so if you're at all like me, making a huge salad one day and just eating it sporadically over the next two days can sometimes be a biggggg time saver. I hurt my leg so I don't exercise lately except walking from the bus to the apartment and eating veggies more has helped me not gain the weight I lost when I got food poisoning, hahaha. And I'm not starving, which is nice. So...veggies! Seriously. Because you're apparently supposed to get like 9 half-banana-sized servings a day or something. It's crazy, but if you can actually get that much, you'll feel better, I promise. And drinking water seldom works. Oh well. Still a good idea anyway, but not as a way to ignore hunger.